Even if you are familiar with a run at lower flows, before taking clients on high flows new to you, consider "retraining" on the high flows with one or more practice runs. Holes and lines which are runnable at moderate flows may become too dangerous, while new safer routes–sometimes along the sides, sometimes down the middle–often open up. Re-emphasize the basics: Keep your boat right side up and keep your people in the boat. Give extra thorough safety talks and in-boat training. 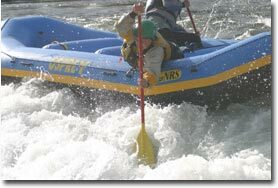 Because mishaps and the resultant pandemonium can occur any time, including the instant you leave the put-in eddy, take extra time right at put-in to provide super thorough in-boat trainings–teach people how to: paddle well, stay in the boat, dig through holes, avoid entanglement (keep lines coiled, etc. ), and, if swimming, avoid and cope with holes and strainers. Keys to keeping people in the boat: Teach them how to sit and how to brace their feet. And teach, practice and use the "lean in", the "lean in, get down", and when necessary the "hold on, lean in, get down" commands. At the very least, teach and use the "lean in" call before hitting holes and big waves–especially sideways! Err on the side of caution. Look far ahead and start super early to miss obstacles–which come at you much, much faster in high water. To keep swims short, tighten boat spacing–often down to two to five boat lengths. With this tight boat spacing, emphasize that swimmers should immediately swim as fast as they can to the nearest right-side-up boat. 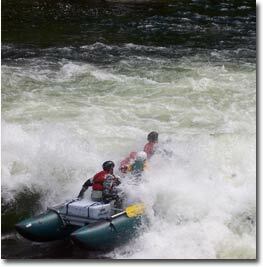 During extreme high water, to prevent swimmers from getting away downstream, maintain a downstream safety net by placing either the strongest crews and guides (possibly with oar/paddle rigs) or dedicated safety boats (16-foot safety cats and kayaks) in the lead positions. High water rigging and gear: Rig a flip line across the bottom of your boat. Rig grab lines around the perimeter or at least along the straight sides of your boat. Dress yourself and your crew for a swim. Wear a brightly colored high-float life jacket with 22 lbs or more of buoyancy. Remember that with high flows the banks are often lined with strainers, and stopping may require spotting a large eddy far downstream and starting early to develop momentum into it. Above all, do not be complacent or laid back. Realize that high water increases the risks for all rivers, including class III. 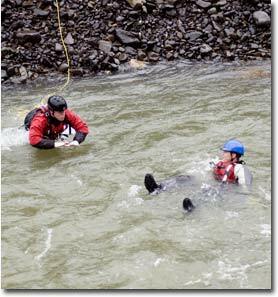 Know and practice these high water safety guidelines. Be alert. Really, thoroughly prepare yourself and your crews for the increased risks and heightened pandemonium that high water can trigger. With your fellow and sister guides, talk about, think about and practice rescue scenarios, including ways to rescue swimmers and other boats without getting your own boat into trouble! 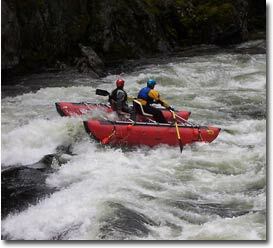 Realize that in some scenarios you may have to be very active—for example, if there is trouble upstream, some guides may need to hustle fast up the bank to provide help in a hurry, while others stay with, communicate with and divert, entertain and reassure all of the downstream clients. Of course, if there is a serious injury, we must provide care all the way to the hospital or until the patient is turned over to trained medical professionals. Another big thing: As much as possible, even as you emphasize safety, remember to have and inspire good humor and fun, and focus on the positive. Even if a secret (to the clients) part of you feels gripped with fear, also cultivate and stay in touch with–and give voice to–other genuine parts of yourself: Parts which might be excited, intensely alive, energized, deeply appreciative of life itself, thankful for your crew, calm, awe-struck by the sheer beauty of the canyon, etc. Ultimately, it is essential that each trip leader set a tone of Safety First, and make sure that all of the guides on each trip create a safe and enjoyable experience for the guests. If a guide is not providing a safe, enjoyable experience for his or her guests, the trip leader should speak with the particular guide and also inform the area manager or company owner.